We build quality into every Norman® product to ensure long term performance and value. The result is a trouble-free product ownership experience. 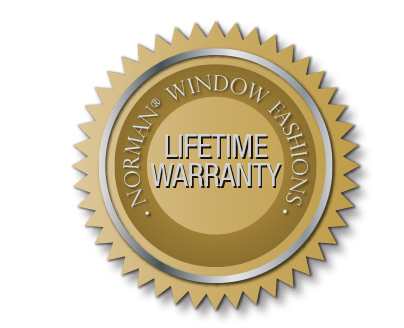 Norman® products are backed by a lifetime warranty against defects in materials and/or workmanship for as long as the original purchaser owns the product. Warranty claims must be accompanied by proof of purchase as well as details regarding the nature of the problem. To obtain warranty service, please contact your servicing retailer. Repair or remake of defective products is the sole remedy under this warranty and in no event shall Norman or its licensed distributors or retailers be liable for costs to remove and/or reinstall the product. Repairs will be made with only like or similar parts. This warranty does not include shipping charges, costs of labor for measuring, installation, or trip charges. Discoloration or fading, chipping or cracking, caused by exposure to the elements (sun, moisture, water) is normal on paints, stains and textiles and they are warranted for 3 years. (Exception: Woodlore® shutters are warranted for lifetime). Motorized components are warranted for 5 years. Cords are warranted for 7 years against fraying. Commercial/contract orders are excluded from this warranty. This warranty is exclusive and in lieu of all other obligations, liabilities or warranties. All other warranties, both expressed and implied, are explicitly disclaimed. In no event shall Norman Window Fashions® or Norman® distributors/ retailers be liable or responsible for incidental or consequential damages, or for any other direct or indirect damage, loss, cost, expense or fee. Some states do not allow the exclusion or limitation of implied warranties, or incidental or consequential damages, so the above limitation may not apply to your state.